If plaque and tartar is left on the teeth, it provides the right conditions for bacteria to thrive. The bacteria irritate the gums, which means that they bleed more easily. You may notice this while brushing your teeth, or eating. This is the early stage of gum disease. Scaling and polishing is the treatment done once in every 4 months. Prosthodontics is the dental specialty using facial and oral prostheses to treat or correct appearance, speech and swallowing problems caused by disease or injury. This includes dentures, dental implants, and oral and facial prostheses. Believe it or not, gum problems are the most common diseases affecting the human population. In health, the gums firmly grip the neck of the tooth. Gum Depigmentation is a procedure carried out in patients who have brown to black coloured gums instead of them being pink in colour.The cause of this could range from excess melanin pigment production to smoking.Whatever may be the cause, the darkened gums hamper the quality of smile. It is now possible to get bright healthy pink gums with the simple procedure of gingival depigmentation. Gum Surgery, or Periodontal Plastic Surgery, is a procedure to treat the Gingiva (Gums), The soft tissues of the mouth that surrounds the neck of the teeth and supports the bone. Periodontal surgery is a plastic (reshaping) surgical procedure designed to restore and regenerate normal form and function to lost and damaged periodontal structures which support the teeth (the gum tissue, periodontal ligament and bone). 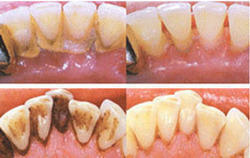 Treatment of gum disease which is one of the most common causes of tooth loss in adults after decay. Bone surgery: This procedure is done to smooth and shallow craters like defects in the bone due to mild or moderate bone loss. Bleeding Gums, Bad Breath, Stickiness in the mouth are ALARMING signs of an underlying gum disease. We provide treatement for all forms of gum and periodontal disease under strict sterilization protocol and all necessary accredations. Teeth are attached to the jaw bones through a complex network of fibrils (periodontal ligament). These fibres allow the teeth to move slightly during eating, they also tell your brain how hard you are biting on something. Under normal circumstances the periodontal attachment should last a lifetime. Periodontal (Gum) Disease is a “silent disease – until their teeth become loose and fall out, most people do not know they even have it, or how serious it is. It is the #1 reason adults lose their teeth.